Since its development in China thousands of years ago, silk from silkworms, spiders and other insects has been used for high-end, luxury fabrics as well as for parachutes and medical sutures. 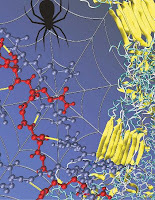 Now, National Science Foundation-supported researchers are untangling some of its most closely guarded secrets, and explaining why silk is so super strong. Researchers at the Massachusetts Institute of Technology's Center for Materials Science and Engineering say the key to silk's pound-for-pound toughness, which exceeds that of steel, is its beta-sheet crystals, the nano-sized cross-linking domains that hold the material together. Markus Buehler, the Esther and Harold E. Edgerton Associate Professor in MIT's department of civil and environmental engineering, and his team recently used computer models to simulate exactly how the components of beta sheet crystals move and interact with each other. 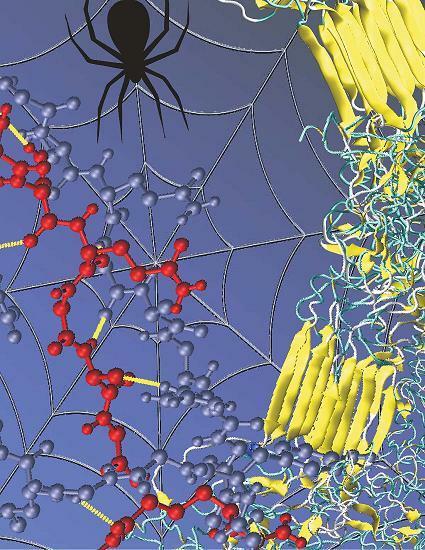 They found that an unusual arrangement of hydrogen bonds--the "glue" that stabilizes the beta-sheet crystals--play an important role in defining the strength of silk. They found that hydrogen bonds, which are among the weakest types of chemical bonds, gain strength when confined to spaces on the order of a few nanometers in size. Once in close proximity, the hydrogen bonds work together and become extremely strong. Moreover, if a hydrogen bond breaks, there are still many hydrogen bonds left that can contribute to the material's overall strength, due to their ability to "self-heal" the beta-sheet crystals. The researchers conclude that silk's strength and ductility--its ability to bend or stretch without breaking--results from this peculiar arrangement of atomic bonds. They say controlling the size of the area in which hydrogen or other chemical bonds act can lead to significantly enhanced properties for future materials, even when the initial chemical bonds are very weak.